Soil Vapor Extraction (SVE) is also referred to as Soil Venting, Soil Vacuum Extraction and In-Situ Vapor Extraction. The technology is not new but the methodology can vary greatly, depending on the sub-surface permeability, depth to groundwater, ground cover and SVE equipment. SVE is a simplified process of removing contaminants from soil and, under certain conditions, can be a very effective methodology. Using SVE at sites with suitable conditions can reduce cleanup costs. These conditions include high soil permeability and Volatile Organic Compounds (VOC) properties, that is, the higher the vapor pressure of the compound (gasoline, natural gas condensate), the greater the amount of VOC that can be removed per volume of air. System pressure (vacuum), air flow rate and temperature also affect the volatility. SVE is not a treatment system in itself. Rather, it is a means of bringing the contaminant to the surface for treatment. SVE transfers the contaminant to the air stream and brings it to the surface as a vapor, free of the soil. This allows simplified and less costly treatment methods, including using the vapors as the primary fuel source for an internal combustion engine. Three catalytic converters treat the exhaust gases to meet air quality standards. Once the SVE Pilot Test has proven that SVE is a viable alternative for remediation, a SVE Event can be performed to continue the process. 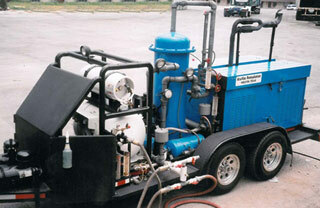 SVE Events consist of applying vacuum to one or more extraction wells. The Event process is a form of remediation that has been adopted for certain sites where the installation of a permanent remediation system is not cost effective or feasible. The Events are usually scheduled once a month and can vary from 8 to 24 hours, to seven consecutive days. The adjacent photo illustrates a multi-well Soil Vapor Extraction Event (SVE) with Enhanced Vapor Recovery (EVR). AcuVac’s multi-well manifold allows SVE to be performed on multiple wells, in this case three, at once. EVR is the process whereby air is injected into the recovery well to increase the volatilization of the hydrocarbons in the groundwater. AcuVac measures the volume and pressure of air injected in relation to the induced vacuum applied to ensure that all contaminated air is being recovered from the formation. The extracted vapors are then burned in the internal combustion engine as fuel.